I actually froze some of them (glazed) so I may update and let you know how those turn out. I have successfully frozen glazed doughnuts before so I anticipate them still being delicious. Doughnuts or us are a sometimes treat and fried ones are a once every six months treat. We don't even buy them. Of course, we don't have a good doughnut place around where I live. We do actually have one that probably is good but they're difficult to obtain right now because they sell from a bike and at the farmer's market. I've only tried them once and it was a ginger doughnut with green tea glaze. It was really great but I can't make a habit of it because I definitely get enough sweets in my day. I would like to say that I found the dough to be surprisingly sticky so it requires a gentle touch and a fair amount of flour. Just be careful not to mix in to much extra flour or the dough could become tough and nobody (I don't think) likes tough doughnuts. It's not difficult to work with though so I don't want you to not try it if you were wanting to try it. It's a great finished product that is worth the effort it requires. :) If you have any questions please ask! Happy Baking! 1. Mix milk through mashed potato together in a bowl and let sit for about 30 minutes until it is foamy. 2. Add the eggs, salt, and flour. Knead the dough then let it rise in a greased bowl covered until it doubles in size. I like to let dough rise in my oven that has been turned on for about 30 seconds then turned off so it is a little warm inside. 3. 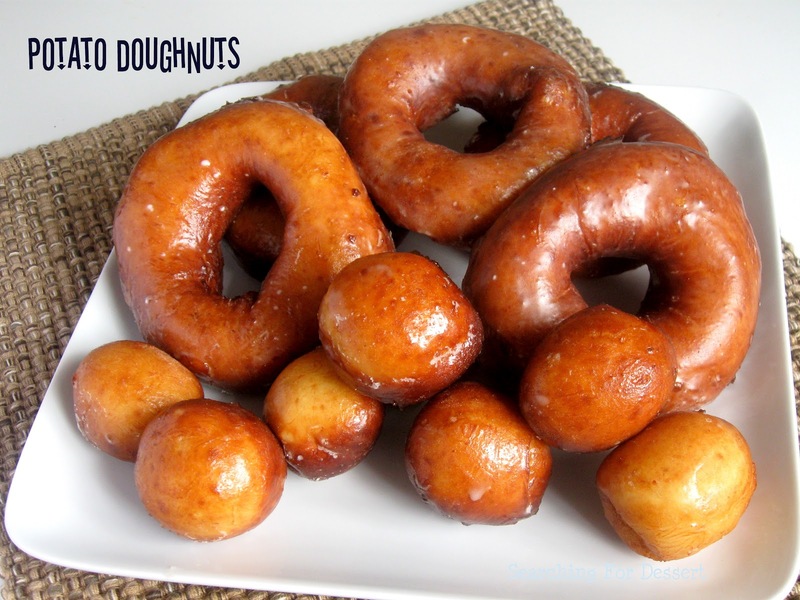 Roll out the dough to about ¾” thick and cut with round cutters into doughnut shapes. Let the doughnuts rise until they double in size. 4. Cook doughnuts in hot vegetable oil until golden on one side, then flip and cook the other side. 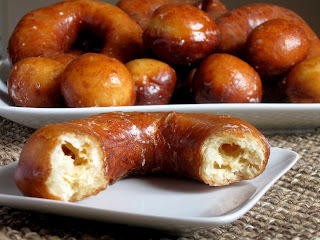 Dip the doughnuts in glaze while they are still hot. 5. Glaze: Whisk together boiling water, confectioners’ sugar, butter, and vanilla until well blended. We used to have a Spudnut shop close by when I was young. It was one of my favorite places to go :) These look super delicious!